The band, due to reunite to collect their outstanding contribution gong at the Brit Awards tonight, will top the bill at the show in London's Hyde Park. Only yesterday, bass player Alex James hinted that the group's reunion performance at the Brits could be their final hurrah, when he said there was a feeling it could be the "last bow". But today they were revealed as the main act at the BT London Live concert on August 12 which will also feature The Specials and New Order. The show is designed to mark the end of the London Olympic Games the same day. 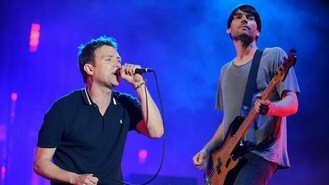 It is billed as Blur's only major live performance of the year and follows a Hyde Park show three years ago. The event will feature giant screens so fans can see the closing ceremony from the Olympic Park. A further special guest will be announced in the coming weeks. Blur, who released their debut album 21 years ago, racked up 13 top 10 hits including two number ones, but fell apart following the release of their 2003 album Think Tank, by which point guitarist Graham Coxon had left. They reformed in 2009 for a series of festivals around the world, including a headline slot at Glastonbury.